Here's all the recipes listed under American Fruity along with the comments posted by the breakfast lovers that submitted them. "If your oranges are particularly sweet, it's a good idea to reduce the amount of sugar. To toast the almonds and coconut, simply place in a medium fry pan over medium heat and - stirring often - cook until lightly browned and fragrant." "A toast to America! A salute to fruit! 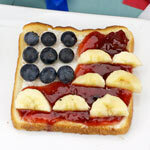 Blueberries, banana and jam are arranged on a piece of toast so it looks like the American flag." "It's sort of a mix between French toast and a cobbler. It makes a lot and it's packed with peaches." "This is a great idea to get fussy kids to eat breakfast." 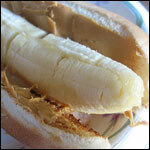 "A fun and easy recipe courtesy of Skippy Peanut Butter and the book The Magic Of Peanut Butter. A great breakfast for kids." "A good homemade bread like zuccini or pumpkin bread work best for this recipe. It's super easy to make and one of my favorites." "This is a classic recipe from a 1948 Chiquita Banana magazine advertisement. "Here's a golden-brown surprise... Banana Scallops."" "A great breakfast with a mixed fruit and orange juice topping. Requires crepes from the grocery store or ones made from your favorite recipe." "Best when served warm! Have a great breakfast!!!" "For even more blueberry taste, top with blueberry syrup and enjoy." "The simple banana gets the royal treatment in this 15-second breakfast recipe (more of an idea, really)." "My mom makes it with vanilla yogurt instead of the ice cream so you could try that too. But you can also get fat-free ice cream so it won't be too bad." 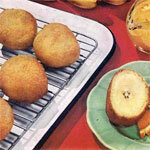 "These fritters are from a vintage 1950 recipe booklet. 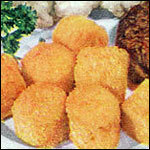 The recipe suggests that they'd make a great side dish or dessert. 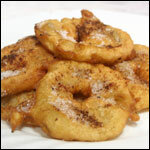 We think they�d make a great breakfast eaten as a donut or pancake-style with maple syrup." "Serve hot with juice. This meal is so good that it is addictive. Have a delicious refreshing breakfast. 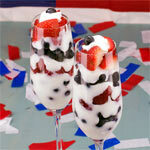 -W. Zgodowski"
"Celebrate America with a red, white and blue breakfast parfait. Great for the Fourth of July or any day of the year!" "I've seen many fruit pizza recipes on the internet. This is our family's favorite. I'd love to hear what people add to it or any modification, so please post your comments and let me know." "This is a great simple recipe - nothing fancy to take away from the pure strawberry taste." "You won't believe one casserole can hold this many different fruits: peaches, pineapple, apricots, cherries, figs, banana and more!" 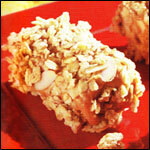 "Baked bananas with buttery Irish cream. Makes a great side dish or have a double serving with some juice and call that breakfast." "These skillet-cooked apples are great one their own (especially with whipped cream), but they also make a nice topping for pancakes and waffles." "This is sooooo good served warm with milk or vanilla ice cream. However, it's best eaten the first day. The topping will become soggy from moisture in the apples." "This Amish recipe uses up those crisp fall apples in a yummy way, served warm with milk or as a side dish with pancakes." "A tasty oatmeal filled with raisins and dried apricot, then topped with bananas and, for crunch, some Grape-Nuts cereal." "You can layer the ingredients in any order you want... or create multiple thin layers. However the strawberries will be juicy so it's best to have those toward the bottom." "Wonderful on toast or as a topping for waffles or crepes. Chop the apples coarsely for chunkier consistency." 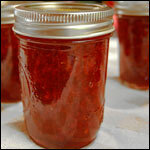 "This great jam stores well for 2 weeks. It's not a keep-in-the-pantry-for-years jam where you have to boil the jars and all that jazz." "It's so easy- the KIDS can make it themselves! Best in the morning but is just as good at any time during a summer day! 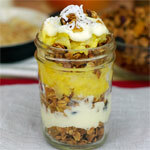 :)"
"For all you lemon lovers, this parfait is a must! Pineapple and coconut add a flavor of the tropics."